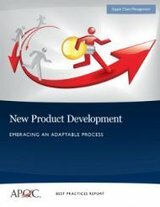 An effective new product (NPD) process is a basic requirement to compete in today’s market. But how do global organizations adapt and modernize their NPD stage gates with rigor and still remain fast and nimble? This best practices report from APQC shows how successful organizations streamline the paths for new product offerings based on risk and/or product type to enable teams to do the work required, without draining productivity by mindlessly racing through the entire process. Click here to read an overview of this report and its contents.